The planned construction of a 21-kilometer-long dragon in central China's Henan Province, a recent topic of public debate, has been suspended by the local government. The local authorities of Xinzheng delivered a written statement to Xinhua which simply said, "We attached great importance to the project after the media reports. The departments of land, environmental protection, and other bureaus have ordered Zulong Company to halt the project because it does not have official approval." On learning of the local government's decision, Li Shumin, president of Zulong Company, the private developer behind the project, told Xinhua that he was considering filing a lawsuit to retrieve the millions he had invested in the project, although he did not specify who exactly he planned to sue. Exasperated Li, formerly the boss of a construction company, said he had just wanted to "do something big" and celebrate the dragon culture but he had been let down by the government and the public. The future of the dragon, whose 30-meter-high head and 800-meter-long body have already been built, is still uncertain but Li confirmed that the scaffolding had been removed from the dragon's head and the construction workers were on leave. "The local government has set up a team to investigate the project and will then deal with it according to the law," a senior Xinzheng official told Xinhua. He declined to say whether the dragon would remain standing or be demolished. The dragon snakes its way along the top of a ridge of Shizhu Mountain, which was designated a national forest park in 2005. 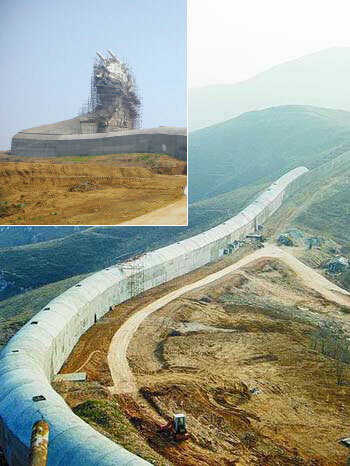 Its body forms a nine-meter-high wall running for kilometers along the backbone of the ridge. The project was expected to cost 300 million yuan to complete but some reports speculated that it could have cost as much as 4 billion yuan.